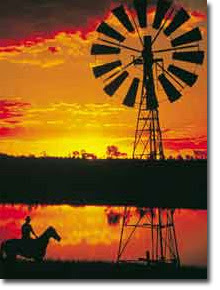 Five Reasons the Best Writers Come from the Outback - and no, that isn't the US restaurant chain....the REAL outback! Sorry...no onion bread! 1. Need a cast of colourful secondary characters? It takes a special kind of person to live in the Outback for years at a time! They definitely count as colourful! 2. Lost your inspiration - the local pub is the best place to go searching for it! And it's likely you can get a nice cold drink to help cool down at the same time! Multi-tasking - you gotta love it! 3. Beautiful landscapes, vivid colours, wide open spaces. Wait...we're not meant to be painting are we? 4. You can talk to yourself, and your characters, all you like. After all, when your closest neighbours live hundreds of miles away, you can't just drop in for a coffee when you want to have a chat! 5. Well....what else is there to do? This meme has been entered in the Tied to the Tracks contest, originating on Rosina Lippi's Storytelling2 weblog. If you'd like to enter the BUCKS & BOOKS meme contest, get the rules here. This meme has certainly done its work. I saw this over at PBW blog and was sufficiently intrigued it the book to put it on my TBB. At this point, what's one more?